Combine audiences to simplify audience management and help reduce the cost of your monthly plan by eliminating duplicate contacts. 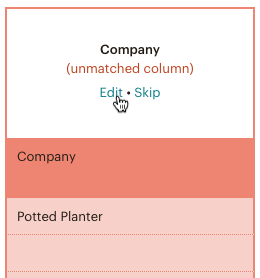 To combine an exported or saved contact audience into a master Mailchimp audience, import a CSV. In this article, you'll learn how to combine audiences with an import. We recommend you backup all of your audiences before you combine them. Keeping a backup is a safeguard and allows you to retain as much data as possible, although some data cannot be exported and will be lost. For this reason, we don't recommend you combine GDPR-enabled audiences. To learn more about what your backup export will and will not include, check out View or Export Your Contacts. If you're on a Monthly Plan, you may want to unsubscribe the subscribers in your old audience after you've exported your CSV file and before you import to your master audience, to prevent your subscriber count from exceeding your current billing plan. This is a multi-step process. You'll need to perform these steps in sequence to complete the task. Decide which of your Mailchimp audiences you want to use as your master audience. Export the audience you want to combine with your master audience. Import contacts to your master audience. To combine a Mailchimp audience with another audience, first export and download the audience you want to merge with your master audience. We'll automatically keep your audience’s subscribed, unsubscribed, non-subscribed, and cleaned addresses in separate files, which you'll need later in this process. To import your exported contacts to your master audience, follow these steps. Click Continue to Match to go to the Import contacts step and match the columns in your import file to the fields in your Mailchimp audience. We’ll automatically match the columns in your import file to fields of the same name in your audience. 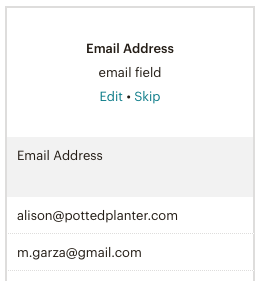 For example, the column that contains email addresses will match the required Email Address field. Click Edit to choose a different field from the drop-down menus. To create a new field, click the drop-down menu and choose Create a new field. Click Continue to Review to review your final import settings. On the You're all set to import! screen, click the status drop-down menu to choose the type of contacts you’re about to import. If your audience export includes multiple CSV files for different types of contacts, you’ll need to import each file separately. Optional: If you want to assign tags to your imported contacts, click the plus (+) icon in the Tag all your imported contacts section and choose or create tags as needed. This is a good way to identify contacts who were combined from another audience. After the import is finished, we'll send a notification to the email address associated with your username. Repeat this process for each type of contact you want to import. After you've combined your audiences, make sure any signup form URLs, and pop-up, embedded, or hosted forms on your websites or social networks to match your new master audience. Learn how to combine multiple audiences into a master audience with the Combine Audiences tool.